I am thankful for those who come into Knitting Temptations to experience first-hand the beautiful yarns that we carry, for those who come in need of knitting guidance, and for those who come in just to share their lives. I am thankful for those who spend their time working at Knitting Temptations – teaching, winding yarns, taking photos, providing customer service, shipping special orders, stocking products, knitting samples, updating our social media, dressing the floor models, helping with special events, and for those who create a sense of order when it feels like things around the shop are like a crazy, twisted hank of yarn! I am thankful for the opportunity to serve our knitting community. The June Cashmere Trunk Show opens at 10am on October 26 and will continue through 4pm on October 27. You won’t want to miss this event that features 1 to 2 skein projects as well as stunning garments. We have been admiring the look and the feel of the samples and know you will love them too! Amy Swanson will be here on Saturday to share the unique story of June Cashmere and its mission. As the Knit Purl Hunter KAL is wrapping up, We are excited to announce the dates for Michelle Hunter’s class series, Building with Lace! This series is a wonderful opportunity to grow your knitting skills. We are now accepting reservations for the series which begins on February 6, 2019. Time slots are filling for the 10,000 New Knitters event on November 10. I hope you will join us to share your love of knitting! As you work toward your Passport to the Holidays rewards, many of you are returning your “passport cards” to the shop and receiving your luggage stamps. It’s such fun to watch the progress. I’m looking forward to photographing completed projects and sharing them. It’s not too late to join in the fun! Finally, don’t forget to take advantage of the opportunities we offer to knit with others. Creating Friends meets on Tuesday evenings from 6-8pm and Friday morning from 10am to 12pm. Knitting Temptations is a busy place this fall! Building Blocks is underway, as well as the Knit Purl Hunter KAL. Both of these offer great learning tools for knitters. Time slots are filling for the 10,000 New Knitters event on November 10. I hope you will join us to share your love of knitting! As you work toward your rewards, many of you are returning your “passport cards” to the shop and receiving your luggage stamps. It’s such fun to watch the progress. I’m looking forward to photographing completed projects and sharing them. It’s not too late to join in the fun! The June Cashmere Trunk Show will open at 10am on October 26 and will continue through 4pm on October 27. Preparations are in full swing. You won’t want to miss this event that features 1 to 2 skein projects as well as stunning garments. Also, Amy Swanson will be here on Saturday to share the unique story of June Cashmere and its mission. Finally, be sure to check out the helpful article on Steps to Create Successful Projects Using More than One Color of Yarn. Autumn Has Finally Arrived in Ohio! With the arrival of cooler weather, things are warming up at Knitting Temptations! As always, we have a full slate of expertly taught classes. We are offering our “Passport to the Holidays,” a game that promises to be fun and help simplify our gift-giving. Also, we have several special events planned – I am so excited for the June Cashmere trunk show in October, as well as the “10,000 New Knitters” event in November. The Mystery Knit Purl Hunter KAL begins October 4. As we create a stunning garment, the beautiful Sueño yarn will keep us cozy. We have many opportunities to gather and create. I love welcoming you to Knitting Temptations! Michelle Hunter Begins her 15th Session of Building Blocks! Building Blocks begins Tuesday, October 2, 2018, and continues on the first Tuesday of every month for 12 additional months. Space is limited for this series and will be filled on a first-come, first-served basis. Building Blocks is a skill-building series. The only prerequisite is that students are proficient in the knit, purl, and cast on stitches. Over the 13-months, students build skills and confidence as they become experienced knitters. They learn new stitches, tips, and techniques. Participants leave the Building Blocks series with a treasure trove of knitting knowledge. This series progresses through major knitting concepts while creating one knitted square a month. In the final class, students learn to arrange and sew their twelve beautiful blocks to create a wonderful afghan. The course registration fee of $250, which includes the book, Building Blocks, equates to the incredible value of less than $18 per class. Payments may be made with cash, check, or credit card. If paying for the course in full creates difficulty, please contact the shop owner, Karen Wilkins. She is happy to work with potential students to make this wonderful course affordable. In addition to our Friday Friends gathering on Friday mornings, 10:00am -12:00pm, Knitting Temptations is offering more times for friends to gather and create together. We welcome all fiber artists, including knitters, crocheters, spinners, weavers, felters and others of all skill levels. Bring your project and join your creative friends for support and advice. A member of the staff will be available to answer questions and offer limited guidance. Problems requiring more assistance may be scheduled for a later time. Join Michelle Hunter in class to learn how to knit this bonnie o’ sock! Previous toe-up sock and cables experience is required. Elevate your sock knitting skills from the plain vanilla sock to a Celtic beauty. This class is perfect for those who have learned to make a toe-up sock and are ready to kick it up a notch! Learn Michelle’s expert tips for reading and working from charts as she guides you through knitting this unique design that includes ribbing on the toe, short-row heel, and leg, as well as the intricate cables that wind their way from toe to top. Please purchase your supplies prior to class day. There is no pre-work for this class. Don’t get “stranded” in your Fair Isle knitting! After our weekend of inspiring Fair Isle knitting and color play with Janine Bajus, we want to keep the enthusiasm going! To that end, we’re introducing the start of a gathering for Fair Isle knitters (whether you attended our Janine Bajus workshops or not) who are interested in continuing to practice and refine their skills of color choice, stranded knitting, and color design for Fair Isle work. Similar to our Friends Knit gathering on Friday mornings (10am – 12pm), this gathering is not instructor led, but rather a time to join other knitters to support, share swatches and projects, and knit together. We’ll kick the gathering off on Thursday, November 9, 6:00pm – 8:00pm. Then, plan to join us (about) every other Thursday evening — we’ll gather again on November 30 and December 14. More dates will be scheduled after the beginning of the new year. Are you ready for a Weekend of Fall Color? Don’t miss this exciting learning opportunity when Janine spends the weekend at Knitting Temptations leading her signature workshops on color theory and Fair Isle knitting. Join us for one of these phenomenal classes, or immerse yourself in an entire weekend of colorful learning! All classes occur during the weekend of Friday, October 13 to Sunday, October 15. Keep reading for workshop descriptions. If you have any question or wish to register, please call us at (614) 734-0618. NOTE: A 8:00am continental breakfast as well as light snacks will be provided for our students each day of the weekend. Students are encouraged to pack a lunch (microwave and full-sized refrigerator available for use) or enjoy one of the many delightful Dublin eateries within easy walking distance of the shop. SPECIAL PRICE of $400 is extended to those who wish to join us for ALL THREE WORKSHOPS! This workshop is ideal for knitters who want to explore Fair Isle design, but are hesitant to start from scratch. Students select one of 7 colorways & receive a classic Fair Isle tam or hat pattern. To see the effects of color change, knitters will begin by working a series of swatches. Students will learn how color is arranged traditionally in Fair Isle designs. Janine will demonstrate the steps to complete the tam/hat chart in a way pleasing to the knitter. Prerequisite: Some experience in 2 color stranded knitting and knitting in the round. Join us for a day and a half of inspiration! 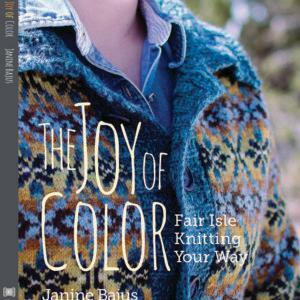 Janine will discuss color theory and possible sources of colorwork inspiration. To understand the various interpretations, students will knit a series of swatches and choose their colors for knitting exploration. 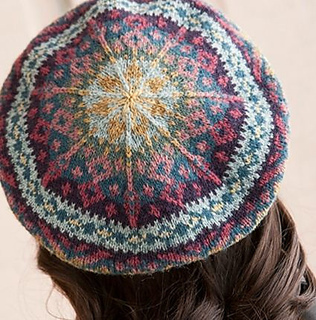 After analyzing the results, students will work with the tam/hat pattern, and Janine will demonstrate the processes of adding colors to a motif. By the end of class, students will have motif swatches and be ready to select yarns to create their own Fair Isle tam/hat. Prerequisite: Experience with 2 color stranded knitting. Wondering what to do with the odds and ends of the wonderful yarns accumulating in your yarn basket? Creating a “Magic Ball” is a wonderful way to put them to great use! In this class, Janine will teach how to arrange random colors in a way that looks intentional and not scrappy. Students will create a magic ball of yarn that is ready to knit the item of your choice with unpredictable results. Janine will discuss stitch patterns that will showcase the magic of your yarn ball. Janine’s handout will include several patterns including a cowl and a stranded cap. We will have copies of Janine’s book for our workshop participants and customers to purchase. If you are interested in owning this beautiful book, please call! We want to ensure that we have enough copies for all! And don’t forget to have your book signed when Janine is at Knitting Temptations Oct 13-15! You can explore more information about Janine at her website, feralknitter.com. 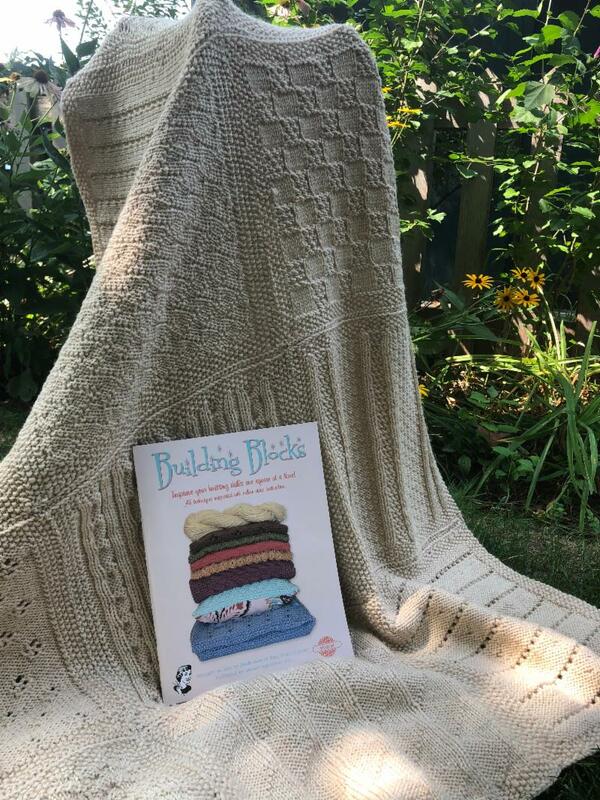 Knitting Temptations is thrilled to offer a new skill-building series, based on Michelle’s NEWEST book, Building with Lace. The series, to begin September 6 at Knitting Temptations, is a unique chance to take the series in its entirety with the designer and expert instructor, Michelle Hunter! This ten-class series focuses on lace techniques that will delight both the novice and experienced lace knitter alike. The project is a gorgeous sampler shawl worked in Rylie by HiKoo. This luxuriously soft yarn is the perfect choice to showcase the high impact stitches. The shawl is knit in one continuous piece (no seaming!) and measures approximately 22″ x 72″. As with Michelle’s previous series, each month of the course will focus on skills and stitches to build your lace knitting skills. The techniques include advanced decreases and increases, Japanese stitches, beading, expert edges, original stitch patterns, classic lace techniques, and so much more! We have two class sessions available: afternoon 2:00pm-4:00pm AND evening 6:00pm-8:00pm. Seats are limited to 24 per session and filled on a first-come, first-served basis. Each of the classes will meet once a month on the first Wednesday of the month. (Please see the complete schedule below.) To help you judge the time commitment, the amount of knitting each month is more than a Building Blocks square, but less than a Building in Color panel. Each section is approx. 120 stitches wide and 50 rows high. Unlike Michelle’s other series, each section MUST BE completed before moving on to the next one. As with her other series, Michelle has videos in place to help you at home. The series registration fee is $250.00, and includes the book, Building with Lace, which is distributed at the first class in September. The course fee is due IN FULL at the time of registration. Payments may be made with check, cash, or credit card by calling (614) 734-0618 or stopping in the shop during business hours. If paying for the course in full creates difficulty, please contact the shop owner, Karen Wilkins. She is happy to work with potential students to make this wonderful course possible for all. We understand that at times unforeseen events occur in life that may necessitate you to drop the course after registering. However, if you drop the course prior to August 15, you will receive a 50% course refund. Unfortunately, no refunds can be given after September 1. A complete list of course supplies is included in this letter. As with ALL our classes, it is our policy that you MUST purchase your yarn and other class supplies at Knitting Temptations. Knitting Temptations is thrilled to offer the Building with Lace series with Michelle. As many of you know, she is reaching new audiences far and wide with the Knit Purl Hunter Progressive Needles Knit-Along series sponsored by Skacel, her book and magazine publications, as well as workshops and appearances around the country. We are honored by her commitment to Knitting Temptations. Please let us know if you have any questions. We look forward to hearing from you! Note: The first class will meet from 1:00 pm – 4:00 pm for the afternoon session and from 5:30 pm – 8:30 pm for the evening session. Listed below are the dates for the entire series. US 6 (4 mm) or size needed to obtain gauge. A 32″ sharp-tipped circular needle is recommended. 628 Size 6 round beads. Purchase the beads at a later date after class discussion. 22 stitches and 29 rows = 4″ in stockinette. Please take the time to work a gauge swatch prior to the first class to ensure the correct yardage. Knit a gauge swatch: Cast on 30 stitches and working for 40 rows in stockinette. Measure the inside of the swatch to assess the number of stitches in 4″. If your gauge is different than the gauge stated above, change needle sizes and try again. Remember, loose stitches use more yarn and may require additional skeins. Swatching is important!